Where can you get a 28-inch thin crust and a 30-inch deep-pan pizzas in town? 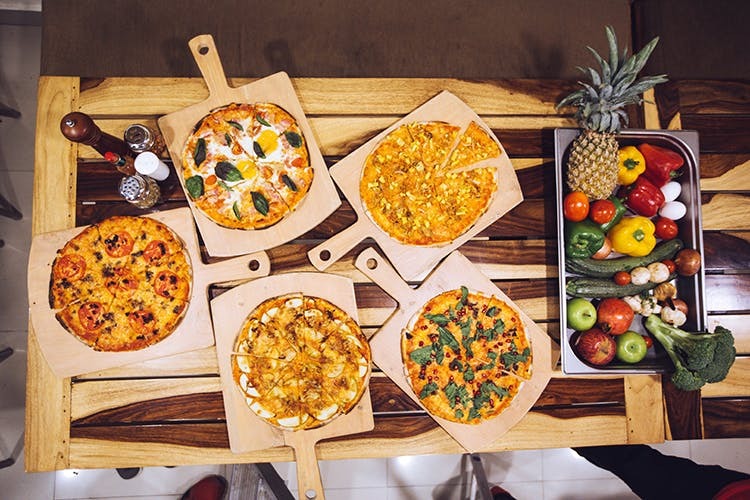 Hunt no more, because this charming little Italian- American place, that goes by the name Baked & Wired Pizzeria in Kalyani Nagar, is serving city’s biggest pizza along with some fresh Artisanal bread, gourmet desserts and flavoursome pastas. Started by Chef Manan Maheshwari, Baked & Wired is a quaint gourmet restaurant with outdoor and indoor seating setup displaying classy yet minimalist ambience basking in warm yellow lights. This place is all about great pizzas that come in eight, 12, 28 and 30 inches. So whether you are a gang of three or ten, Baked & Wired has got you guys covered! Get the old-school Margherita pizza topped with fresh tomatoes and basil in 28-inches for INR 950. If you’re a gang of three, then go for the eight-inch thin crust version for INR 220. The Roast Garlic Chicken Pizza with mozzarella cheese is a must try! The thin crust 28-inch version will cost INR 1,300 and the deep an 30-inch comes for INR 1,900. Vegetarians, the Magic Mushroom with sautted button mushrooms in olive oil, garlic and chilli flakes is love! While, the eight-inch version come for INR 290, the 12-inch will cost INR 390. If you’re a pork person, you have to try the Piggy Delight topped with pepperoni, ham, bacon and mozzarella cheese. Try the 30-inch deep pan for INR 2,600. For pastas, you have to ask the chef for the weekly special. End your meal with a bite of Panna Cotta with papaya coulis and desiccated coconut for INR 160. The pizzas are gigantic and are made of whole wheat and glutten-free bases. The pastas are handmade. The desserts are to die for! Tag the big gang and off you go to try the best of American and Italian cuisines.